Died due to the events of September 11th, 2001 at the Pentagon. CDR Schlegel was originally from Gray, Maine. He was known for his keen wit, forthright nature and avid interest in ice hockey and football. 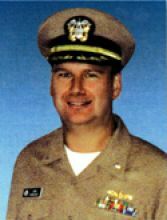 CDR Schlegel carried on a Navy tradition deeply embedded in his family as his father and two brothers also served in the Navy. CDR Schlegel was devoted to his wife, Dr. Dawn Schlegel, and shared many wonderful memories of their times together in high school, college and 13 years of marriage. He lives on in the hearts of his many friends, colleagues and family. I could not have imagined the impact that participating in TSP would have on me. Last weekend, I had the honor of carrying Naval Commander Robert Allen Schlegel’s memorial stone to the summit of Cadillac Mountain. I learned about TSP from a dear friend who was completely moved by her involvement in the 2014 Memorial Day Weekend hike at Katahdin. I was intrigued and signed up, in full support of the premise that our soldiers should never be forgotten. While I was without any connection to the military or military families in my present day-to-day existence (until last weekend! ), my upbringing was certainly shaped by several missing ancestors. Most directly, my father grew up never knowing his father, who was killed in WWII when he was just 6 months old. I faithfully wore the POW bracelets in the 1970’s given me by my mom and dad during Vietnam. I was in elementary school, but well aware of the fear, anxiety, and loss all around me. Fast forward all these years to Cadillac Mountain on October 4. I learned as much as I could about Rob Schlegel before that day and was overwhelmed by the experience. Rob was killed on 9/11 at the Pentagon at a moment in time that I will never forget. None of us will ever forget in our own personal ways. But the fact that I was assigned to carry his memorial stone is particularly amazing to me. Now, there is no way that anyone could have known the common interests I share with Rob. We were the same age on 9/11, we both shared an interest in higher learning and international affairs, loved Maine and our families. Everything I have read about Rob – the tributes from colleagues, and especially his wife, leads me to believe that he was a sentimental, down to earth, and caring person. And he was witty and funny too! Qualities we all strive to emulate. Moreover, in researching Rob, I learned that his college fraternity started a scholarship fund in his name after his death. Rob graduated with high honors from Washington & Lee University in Lexington, VA, and went on to achieve a Masters in International Affairs. The “Schlegel Prize” funds students at W&L to attend “conferences on foreign affairs.” Well, I happen to direct a prominent foreign affairs Conference right here in Camden, Maine. I believe that the fact that I was assigned his stone is no accident. My hope is that I can provide a link between students from Rob’s Alma mater and the Maine that he loved so much! I can think of no better way to continue his memory than to bring like-minded students to Maine to learn about foreign affairs – a subject that Rob held dear. I truly hope to facilitate a connection between The Summit Project, Rob’s family in Maine, and the Schlegel Award – all together in some extraordinarily meaningful way. I am forever indebted to Naval Commander Robert Allen Schlegel and his family for their sacrifice and grateful for this opportunity to keep his memory alive. The bonds created last Saturday and the support I received from my Team Kebo colleagues were incredible! In just one day, I gained lifelong friends and comrades whom I hold close to my heart forever. Thank you to Major Dave and The Summit Project! Kim, Thanks so much for doing this last year. As a friend of Rob’s, I still cannot believe the events on 9/11/01 has touched the lives of this small community in Maine. I, personally know of two people that perished in the attacks, Rob and a classmate from USM who was in the South Tower, above the floors of impact. Rob was witty, musical, gifted with languages and they type of guy you wanted on your side. If you are ever in Gray, stop by the high school and check out the monument they erected on the grounds there. Kim, you hit the nail on the head in describing Rob Schlegel. I had the privilege to serve with Rob on his last ship as his Command Master Chief and I never served with a more professional and amiable officer. He could get things done with his ever present smile. We worked side by side 24/7 for a year and it was an honor to have done so. His was a great loss for all who knew him and the country. Kim – As one of Rob’s college fraternity brother’s who helped establish the Schlegel Prize, your words are EXACTLY what we were working with Dawn to create in Rob’s memory – an opportunity to magnify his spark and drive carrying forward not just his memory but his passion. I hope that you have been able to connect with Washington and Lee to create more connections to Rob in the hopes of creating a deeper understanding of International Relations and how to build peace from the ground up. If not, let me know and I will try to help make that connection. It would be an honor and a privilege if a W&L student could help carry Rob’s stone, and his legacy, to the peak of Cadillac Mountain – and participate in your conference. Thank you for helping to preserve and nurture Rob’s legacy! It’s in the spaces between. Like the way the brain works. Everything that happens in the brain – every thought, idea, memory, inspiration, flash of wisdom, every thrill, every supposition – all those activities occur not in the blood, nor the tissue, nor even the neurons in our brains. Those processes that we think of as happening in the brain, actually occur in the spaces BETWEEN the neurons, in the synapses. An electric spark leaps out into the space between neurons, and something magical happens. When it came to volunteering for the Maine branch of The Summit Project (TSP), I did so out of respect and a sense of duty. What I didn’t expect was what started off as a somewhat anonymous task would reach out and make connections between the service member whose memory and stone I carried, and myself. It was both surprising and not surprising, Surprising in that Robert D. Schlegel and I were from different home towns, different ethnic backgrounds, served in different branches of the military. Not surprising because as those of us who marched that day began to share our stories, there would be one person after another who would share their unexpected connections. For example, it turned out that one young woman was from the town where her service member would vacation; they walked along the same beach. The stone she carried came from the same beach where it was extremely likely the two had passed one another over the years. Strangers whose unexpected connection would in retrospect bridge the space that separated them in time. Another older gentleman it turned out served on the same boat as one of the servicemen we commemorated that day. And this was how the life of Navy Commander Robert D. Schlegel of Grey Maine intersected with that of Greg Rosa ex-Army, late of Collingswood New Jersey. Early on a bright Tuesday morning, as Commander Schlegel wore his pressed uniform to start the work week, my day had not at the graphic arts studio had not yet begun, but the ties that would bind us together were already in the wind. For as his day started in Washington DC, I was back in my home town of New York City. The day began just as any another post-Labor Day weekend, Tuesday September 11th, 2001; it would end much different. On that day, as a New Yorker, as an ex-soldier, as an American, I was tied to Robert D. Schlegel’s story. Through the same strange circumstance of sometimes capricious fate which led a Mainer to DC and a New Yorker to Maine, it was an unlooked-for honor to be able to cast a light on the circumstances of Commander Schlegel’s story. When we Summit Project marchers gathered together along the Back Bay on that cold morning to share the stories of the service members from Maine we were commemorating, I felt like we were each of us a part of something greater. We had gathered together to persevere in a common task, to maintain focus, to do honor to ourselves and those who had fallen, and who had given the ultimate measure, out of selflessness. As we shared of ourselves physically on that day, and emotionally and spiritually as we compose these letters afterwards, as we relate how their sacrifices impact our lives, it’s as if we bridge the distance between the writer of these words, the marchers on that day, and whoever might read this letter. By telling these little stories of our common humanity and the unexpected ties that we each found in becoming involved with this project, we bridge the gap, and help to fill up the spaces between us. It was an honor and a pleasure, a labor worth undergoing, and a deeply moving experience. Thank you for the privilege. Yours is the first letter to which I have responded, but I have read many. The undeniable links between the past, the present and the future in the TSP connections is nothing short of other worldly. Thank you for sharing your story. I believe each person who participates in this memorial endeavor adds something positive and immeasurable to change lives for generations to come. It was my honor on May 29th to carry Commander Robert Schlegels memorial stone to the summit of Mt. Bigelow. The experience was truly wonderful. At times during the hike it was getting hard for me to push on but i would remember why i was doing this. I was doing this to honor Commander Robert Schlegel and the sacrifices that he had to make to give us our freedoms so we have to make less sacrifices. This gave me the strength and gave me a reason to keep pushing onward. Thank you so much for this opportunity to do this for Commander Robert A. Schlegel. It was a great privilege. I was the fortunate individual that had the honor of carrying Robert’s stone up The Owl at BSP this year, and I just wanted to thank you for that opportunity. It was truly an honor. Leading up to the event this year, I had the pleasure of learning as much as I could about Robert. It quickly became apparent that he was a great man and one who left a lasting impact on this world. After reading about his passion for higher education from one of the other hikers that had previously hiked his stone, I was grateful to have learned about him and his life. I have a strong passion for the education system in the United States, and so it was great to connect with Robert on that level. Alough Robert’s family was unable to be at BSP this year, I ensured that his stone was well taken care of. It definitely felt as though he was watching down all weekend, and the burden in my pack while climbing The Owl was incredibly light, for how much weight was in it; I believe Robert had something to do with that. Words cannot express the emotions and debt that I am in to Naval Commander Robert Allen Schlegel and his family for allowing me to continue his legacy by hiking his stone in Baxter State Park. I will ensure that his memory is never forgotten, and that his legacy lives on. I had the honor and privlidge of carrying CDR Schlegel’s memorial stone for the Portland GoRuck Challenge on June 5, 2015. Over the course of the 14 hour event, I had the time to reflect on Robert’s sacrifice, the events of 9/11, and the path that this country has taken since that day. While researching Robert, I was struck by how genuine of a guy he seems. Photos of him frame him as an easy going guy with a great smile and an approachable demeanor. The words of his peers, classmates, and subordinates show him to be of the highest caliber in officer, friend, and mentor. I would like very much to have known Robert. I reflected on that what day meant to me as a post-9/11 Veteran. I was in college, putting on my Air Force ROTC dress blues when the attack happened. As a future service member, it was a stoic reminder of what the uniform means and what “service” really is. As gung-ho as well are in the service to take the fight to the enemy, the hard fact is, that we don’t always get that chance. Sometimes the enemy comes knocking our door as it did on 9/11. When that happens, it’s catastrophic. Robert’s sacrifice for our country, as well as the sacrifices of the other 2,995 people who’s live whose lives were lost, opened our eyes and changed the course of this country. This cannot happen again and Robert’s memory is with me and with countless other members of the military, government, and law enforcement as work tirelessly to keep the fight where it belongs, away from our shores. While we can’t bring back our loved ones, it’s the constant remembrance and honor of their memory that keeps them alive. Death is inevitable to us all. It’s how we’re remembered that makes us immortal. Robert’s memory is secured in the grateful remembrances of our countrymen and specifically with the men and women of The Summit Project. Thank you from the bottom of my heart for the opportunity to get to know Robert. I will carry his memory with me for the rest of my life. Given the opportunity, I would carry the weight of his sacrifice via his Summit Project stone, time and time again. Best wishes to you and those who surround you. Upon signing up for The Summit Project I was filled with such pride. To think that someone who graduated from the same high school as I having the compassion and drive to conceive, orchestrate, and carry on a living memorial for our fallen heroes… it truly was inspiring. I was counting down the days until the big hike. As we hiked up Cadillac on October 17th, I I knew that it would be a day of sharing stories of our soldiers, sharing tears, and rejoicing in this life that we live freely – and we live freely thanks to their ultimate sacrifice. I wasn’t prepared for how quickly those of us who had volunteered would bond and move as a cohesive group – sensitive to the needs of each other, and championing one another along the way. When you hear the phrase “Live a life of purpose” it takes me to the lives of our fallen. They willingly and knowingly signed up to put themselves in harms way, putting others before themselves. We will never know the impact that their sacrifice has and will continue to make on others, but our hike Oct.17th showed me a glimpse of 19 lives that were emotionally invested in carrying on the legacy of their soldiers sacrifice. As I carried Commander Robert Schlegel’s stone up the mountain I found myself going back to the stories I had read. What kept replaying in my mind were the moments he would take to call family members, talk sports, check in. You don’t realize when you’re in those moments that those are the times you cling to when someone is gone. With friends remembering him as the type of guy you would want on your side, I can imagine he would have enjoyed the chatty banter, laughter, and camaraderie of our hikers this past TSP hike. I am so grateful to have been chosen to be a part of something so life changing. I know that it sounds so cliche’ but truly, I will carry Commander Schlegel’s story with me much longer than just up Cadillac Mountain. Thank you Summit Project for inviting me to keep Maine’s fallen soldiers stories alive. Saturday, December 12th, 2016 started like any other day, but it would be unlike any other day. This was the day I had been waiting for since July; visiting Arlington National Cemetery, the final resting place of so many of our Nation’s finest men and women. This was the day I chose for one reason; the arrival of the Wreaths Across America convoy delivering Christmas wreaths to every grave in Arlington. This convoy begins in my beloved state of Maine, where I grew up and still call home. More than that, it begins in Washington County, in a small town missed if you blinked. However, this small town shares a large part of who I am. My love for this area was forged at an early age, as my father grew up not twenty miles away. Visits to grandparents over holidays and for extended stays in the summers, both of which have long since been gone, has given me an appreciation as I’ve grown older for what used to be. These wreaths aren’t just any Christmas decoration to me. Having lost my father to cancer in 2004, holding one of these wreaths is a connection to my past. I can’t help but feel his presence in these wreaths; from the same salty Atlantic Ocean air he grew up with, to the aromatic balsam fir that now represents my life now as a forester. These wreaths aren’t just Christmas decorations to the families of the fallen who now reside in Arlington National Cemetery. Just as they are for me, it is a connection to past holidays shared, memories that are forever kept alive, and a longing for just one more special moment with them. Our visit to Arlington National Cemetery on Wreaths Across America Day was to honor your loved one who made the ultimate sacrifice, to respectfully support you as a Gold Star Family through a difficult time of year, and to form a bond between you both through your chosen Summit Project stone. Your husband’s/son’s passion and commitment to protect this Country will live on through his marble marker in Arlington, his Summit Project stone in the State of Maine, and with his life’s story to those we both meet in the future. Your husband/son, our Hero, Will Never Be Forgotten. The Patriot Riders of America Maine Chapter One. We had a spring ride for the troops on May 1, 2016. I had the honor of carrying your husbands’ stone , CDR Robert A. Schlegel, on this ride. It was with great pride and deep sorrow to honor him in such a wonderful way . My wife and I will be part of the Summit Project ride on Memorial weekend and we are looking forward to honoring your husbands memory along with all those who served and who are still serving. May God bless you and your family . On October 14th 2017 I had the distinct honor and privileged to carry the stone and story of CDR Robert A. Schlegel up the Southridge Trail to the summit of Cadillac Mountain in Acadia National Park. In the weeks before the hike I spent many hours researching Robert, learning about his education, his family, his Navy Career, and of course the tragedy that stuck on September 11, 2001 when he lost his precious life in the terrorist attacks against our country. It quickly became clear to me what a dedicated man Robert was. To his education, his family, and his country. The hike up Cadillac was, simply put, amazing. The weather was wild with thick fog and forceful winds but that did not stop the peaceful feeling I felt in my heart. I was tasked with seeing that Robert make it to the summit, no matter what. The weather could not possibly deter me given all that this man had been through in his life. He was dedicated and therefore I was, and will forever be, dedicated to making sure his story lives on. At the summit, as we gathered for our circle, the sun finally peaked through. To me, it was as if Robert was there, shining down on me and the others, showing me he was there and grateful for what the Summit Project does to honor him and his fellow fallen heroes. Please know – Robert’s story, life and death, will forever be remembered and shared by me. I am eternally grateful for the time I spent with his stone and am honored to have been part of this amazing process. My name is Cade from Nokomis Regional High and I had the great honor of carrying Robert’s stone up Tumbledown Mountain. The Nokomis JROTC program did the summit project on 6/8/18 to make sure that our fallen heroes are remembered and honored. I have always had a great respect for our service members as they are brave enough to fight for what they believe in and are willing to make the ultimate sacrifice for what is right. I believe that The Summit Project is a fantastic idea, as remembering our fallen heroes is extremely important as they died so we could be free. As I learned about Robert I could tell that he was a wonderful, smart, kind hearted man. I really respect and appreciate his love of education, as it shows that he knows that above all knowledge is power. I really loved learning about his long, happy relationship with his wife, Dr. Dawn Schlegel. Through my research it shows he loved his state, his country, but above all his friends and family. It was a real shame that Robert lost his life during the darkest day in U.S history. It is horrible and scary to think that their are people evil enough to do these horrible actions. However, it’s really important to remember that these sacrifices inspired many Americans to join the military and serve their country to fight these evils. This shows that people like Robert whom have sacrificed so much for there country, have inspired many to do the same. Almost 17 years after Robert’s unfortunate demise I still see the impact of service of him and many other Americans who have served this country. The Summit Project helps people appreciate and understand that these are people who serve and not just faceless, nameless soldiers. The honor of doing that for Robert will be an unforgettable experience that I’ll remember forever. My name is Maddie Soule, and I go to Gray-New Gloucester High School. On September 15th, 2018, myself and a number of other students and staff from my school summited Mt. Katahdin, and we each had the opportunity of carrying a stone during the hike. When one of my teachers first introduced us to the Summit Project, I thought it was a great idea and I was looking forward to being able to be a small part of it. What I did not expect was how humbling and beyond words the entire experience was. I have lived in the Gray-New Gloucester area my entire life, and being able to learn about a soldier who, like many, lead a selfless life serving others and his country and lived in my own town was a deeply affecting experience for me. Feeling the physical and emotional weight of the stone the entire hike was not only humbling, but honoring. It caused me to take time to really think about the kinds of sacrifices soldiers make on a daily basis for people like me. Because of him and those like him we are able to enjoy the innumerable comforts of our daily lives which we so often take for granted. Although the passing of Robert and the many other soldiers who lost their lives on 9/11 is a deeply saddening and unfortunate truth, it is clear that they are not forgotten and live on thanks to their loved ones and programs such as this. I hope for peace and all the best for the family and friends of the man who gave it all for them. Thank you for letting me be a part of honoring Robert and the sacrifices he made. I am truly humbled. I had the honor of carrying the memorial stone, as well as the story and spirit of Robert Allan Schlegel, for the beautiful hike up Cadillac Mountain last weekend. As I hiked, I kept Robert in my mind and imagined his spirit was with me, thinking about all he accomplished in his life and relationships, and what he sacrificed in doing so. In learning about the kind of person Robert was, growing up and later in his career, it is apparent that there was so much spirit and devotion in everything he did. He had many passions of his own, studying French and Journalism in college. He contemplated a career in journalism, but his love and loyalty for his family and country made him decide to follow in his father and brothers’ footsteps, and dedicate his life to the Navy. It is clear that he excelled, earning various awards and recognitions, as well as serving multiple Naval tours holding various positions from Officer and ultimately to Commander, the highest rank received in his family. I can only guess Robert was humble about his accomplishments, and served selflessly. In reading the words of Robert’s loved ones, friends and those he served with, I know that Robert was a great person to know and to have by your side. They tell how he could light up a room simply with his presence, accompanied by his witty personality and always present smile. As I am a recent college graduate, getting to know Robert and learning about his life has inspired me to follow my heart and what I believe in while deciding where I want to go in life, and to always have a positive attitude while working for the greater good. My team leader for the hike carried an American flag throughout the hike, out in front, with the rest of our team following. It was quite powerful to look ahead as I marched up the, at times very steep, mountain, towards our flag. It made me feel closer to Commander Schlegel and those like him, who served the flag and fought for our country, and who made the ultimate selfless sacrifice. I am so grateful to have had this beautiful experience, and I thank you for allowing me to carry Robert’s memory with me. I am honored to have picked an envelope with Robert’s biography from a display at Penquis Community Action Program in Bangor, Maine. As soon as I opened the envelope I saw Robert’s smiling face in the photo, it made me smile. He looked like someone that would be friendly, brave, happy and very approachable. It touched my heart knowing that he passed on 9/11/01. I can remember that day very vividly, like the rest of us. I prayed and prayed for all the victims and families of that terrible event. Today was just a reminder that we can not forget that families are still out there missing their loved ones. I am sure that Robert’s family and friends miss him so much. I bet he was looking down watching the super bowl and cheering for the Patriots, since his biography says he was interested in football. I will say a prayer for Robert and his family before I go to sleep, paying for peace and beautiful memories of a brave man.